Not sure what that "unplanned" workout is? I seem to have one every week - call the bug squashers! Monday: Day of rest - ahhh. Tuesday: Zone 2/3 bike on the turbo followed by a short run on the treadmill. As (mostly) normal I was using Zwift on the turbo with Apple Watch supplying HR and following the structured plan from Training Peaks. I find this the quickest and easiest route to getting on the bike with the planned training. One thing to bear in mind though is that when connecting to equipment over Bluetooth you can only connect to one device at a time, and it seems that Zwift also wants to be the only app connected to my Wahoo Kickr trainer. If anything else is running on a different device (e.g. iPad/iPhone) or even a different app on the same device trying to connect to the Kickr, Zwift won't list it as a device and you have to hunt down and shut down the other thing. Frustrating. For the run, I just used the Workout app with an Indoor Run activity. Thursday: I was travelling a lot with work this day, so it was just 45 mins strength and conditioning in my "pain cave" at home at the end of the day. Logged on Apple Watch as strength training then exported to TP using HealthFit. Friday: I went to the Triathlon Show in London. I had booked a swim coaching session with the SwimSmooth team. They had a 15m (I think) pop-up pool at 14deg C so definitely wetsuit territory. It was a good session, but tricky to log because of the funny length and because it was effectively all drills - in the end, i just set the Workout app to log an Outdoor Swim which was fine. At the end of the session as I finished a length a friendly voice said "Hello Ian" and it was my wife's cousin Dan standing there! Sort of a surprise since he doesn't do triathlons but we had lunch and agreed to meet up for my run in the evening. In passing, I picked up a new wetsuit (well ex-demo) from Zone3 at a bargain price! Friday evening I went for a run with Dan - this was threshold intervals (10 x 3 mins with 4mins recovery) and I had entered the session into the iSmoothRun app. As I started running I noted that I was not getting a HR reading, and thought that it may have been a setting in iSmoothRun that I had been playing with (its something like "use Apple Watch for HR"), but rather than stop and sort that out, I switched to Apple Watch Workout app and just kept track of the time in my head for the intervals. As it happened the Workout app also took a while to lock on my HR so I am guessing iSmoothRun would have been fine. Once it was locked on HR was fine. I don't consider it to be much of an issue for me, but one to bear in mind. 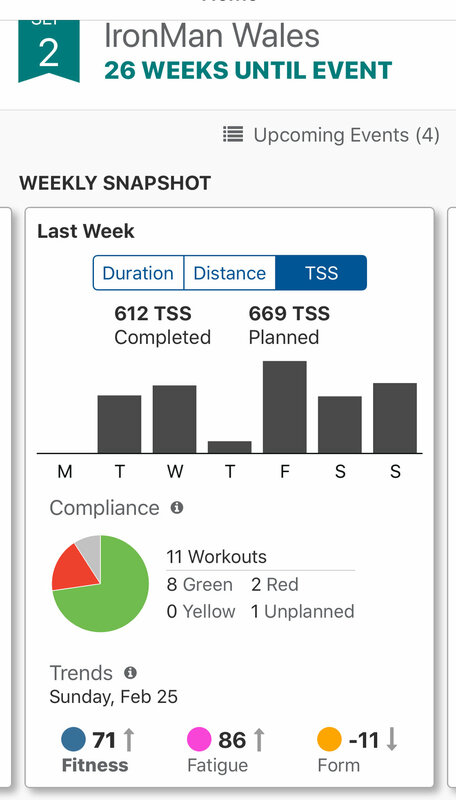 Saturday: More turbo with Zwift - though Zwift lost connection to the Kickr halfway through and I changed to the Wahoo app on iPhone, logged HR on Apple Watch using the workout app and then merged it all together in Training Peaks later. Not ideal. I have had the Kickr since it was first released and seem to be getting more and more issues with it, not just dropped connections but some strange things at high power output where I am not sure it is accurate anymore. Mentally I made a note to take a look at what else is available (the WattBike Atom was at the Triathlon show but is £1500 and not available for 6 weeks - looked nice though). After this session (again late at night) I didn't feel like the 5k run so skipped it. This week we had a small update to watchOS bringing us to 4.2.3. This was a minor bug fix update that came along with updates for iOS and tvOS and macOS - nothing very exciting but worth doing for the security aspect. Following the drama with my mum's heart condition over the last few weeks resulting in a pacemaker being fitted, the consultant cardiologist recommended I have some tests to ensure that I don't have long QT syndrome which is what he suspects my mum had and is hereditary, He asked if I was ok with that and added "it's not very pleasant". I said no problem, but it wasn't until I received the letter this week that I think I understand why he said that. "You will then sit on a bike or stand on a treadmill, which will begin to move very slowly. Progressively, as you become accustomed to the pace, the workload will be increased". Which sounds like a fun day in the pain cave - though this only last 20 minutes :). I'll let you know how I get on, and naturally, it's a little worrying, but secretly I'm hoping they are astounded at the amazing performance I deliver on the day! Apple Watch SOS saved a mom and her baby after a drunk driver hit their car - more and more of these stories of Apple Watch saving lives seem to be coming out - good stuff. Clearly, after reading my incredible blog post regarding Motivation with Apple Watch Apple felt they needed to raise their game, and came out with this new section of the Apple.com web site: https://www.apple.com/watch/close-your-rings/ - very nice it is too.